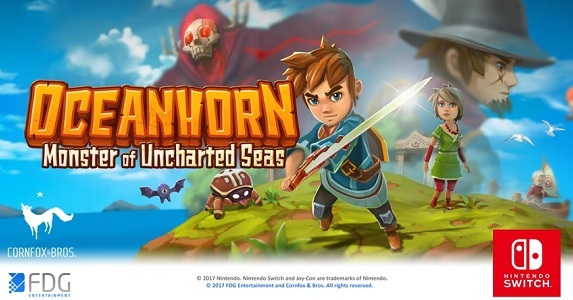 Oceanhorn is an action-adventure game totally not inspired by the Legend of Zelda series, which was among the very first indie games announced for the Nintendo Switch following its official reveal. You get to play as a young man who sets off on a journey to explore the islands of Uncharted Seas, where many dangers, but also puzzles and secrets, can be found. There’s plenty of monsters to fight, magic to learn and use, and ancient treasures which are only waiting for one thing… for you to uncover them! The goal of your journey is to unravel the mysteries of an ancient kingdom called Arcadia, and more precisely a sea monster known as… Oceanhorn. On the Nintendo Switch, Oceanhorn runs at 60fps at all times, with 1080p while docked and “native resolution” (aka 720p) when in handheld mode. This version of the game is apparently based on the PC Remastered version, and more precisely the Ultra settings. Oceanhorn (Switch – eShop) will be released on June 22nd in Europe and North America, and will cost $14.99/14.99€. The Upcoming Releases page has been updated!